I-75 is Michigan's major north/south freeway and is its longest highway, extending 395 miles from the Ohio border north to Sault Ste. Marie at the Canadian border. It connects the Detroit Metropolitan area with northern Michigan recreation areas, en route through the major population centers of Flint, Saginaw and Bay City. The existing four-lane drawbridge, connected to a six-lane freeway at Zilwaukee, is the only one on the Michigan freeway system. It is also the only one on the entire length of I-75 extending from Florida to Canada. Whithin a few years of its opening in 1960, traffic volumes exceeded MDOT projections and the design capacity of the bridge, primarily because of an upsurge of travel to and from Michigan's northern recreation areas. Daily traffic on the existing brawbridge is about 50% more than its design capacity. Average daily traffic currently is about 31,000 vehicles, some 10,000 over its design capacity. On some holiday weekends, traffic increases to more than 60,000 vehicles per day. The problem was further compounded by steady increases in bridge openings for navigation, leading to massive traffic backups and frequent rear-end vehicle accidents. The number of ships moving along that stretch of the Saginaw River averaged about 150 a year in the 1950s. They peaked at 984 in 1978 the year before construction began on the new bridge. Then they declined as dredging operations in the river and use of of the shipping channel by General Motors Corp. declined. Openings in 1986 exceeded 300. The narrow bridge opening--150 feet in a shipping channel 200 feet wide--and a sharp bend in the river near the bridge pose an obstacle to shipping. Ships have twice accidentally rammed the existing drawbridge and have hit pilings protecting the bridge numerous times. Collisions with the drawbridge cause I-75 to be closed to traffic while repairs were made. From 1973 to 1975, MDOT widened I-75 from four to six lanes from south of Flint to north of Bay City in order to relieve traffic congestion in the freeway corridor. However, the four-lane drawbridge remained as a traffic bottleneck. Also, as the bridge ages, its operating machinery has required increased maintenance, causing problems that have more than once closed it to traffic. Further, the Federal Highway Adminstration (FHWA) does not consider drawbridges in keeping with the purpose and function of the Interstate freeway system, which is designed for high-speed, uninterrupted traffic flow. Although the bridge openings have declined in recent years, the Port of Saginaw remains active. Various federal, state, local and shipping association officials say it is uncertain whether port activities will increase or decrease in the future. The decision to replace the drawbridge led to consideration of many alternatives. A tunnel under the Saginaw River would have cost about two-and-a-half times as much as a high level bridge. Major relocations of the freeway were studied and rejected as too costly and impractical. 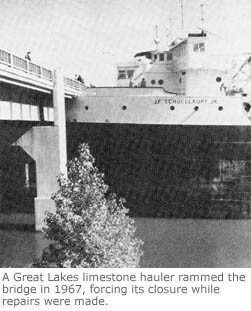 Closing the river to navigation at Zilwaukee also was considered but was opposed by the city of Saginaw and others with an interest in port activity and its economic benefits. Rerouting the traffic onto I-675 ... through downtown Saginaw would have required extensive reconstruction well above the cost of a new bridge. That alternative also was opposed by the city of Saginaw because of its potential adverse impacts on the city caused by greatly increased traffic. After many public meetings, a site immediately north of the existing bridge was recommended for construction of a new high-level bridge. In 1970, the State Highway Commission (now the State Transportation Commission) approved the MDOT engineering report containing the recommendation. Because the site involved right-of-way from two publicly owned recreation areas, a federal environmental impact statement also was required. It was prepared by MDOT and approved by the Federal Highway Administration in April 1974. MDOT prepared and submitted to FHWA preliminary plans for a steel plate girder bridge in 1976. In early 1977, FHWA asked the Department to prepare an alternate design to the steel bridge to foster competition and ths reduce the project cost. MDOT retained Bouvy, van der Vlugt and ver der Niet/Segmental Technology Services, Inc. (BVN/STS) of Indianapolis, Ind., to prepare plans for a precast segmental concrete structure. In November 1978 bids were taken, with contractors allowed to bid on either the steel or concrete bridge, whichever was more economical for them. The low bid of $81 million on a concrete structure compared with $85.6 million for a steel structure. Because the low bid substantially exceeded preliminary estimates, FHWA declined to approve it, adhering to a program initiated by the Secretary of Transportation to combat escalating highway construction costs. Changes were made in the construction plans and a second letting took place in August 1979. The low bid again was for a concrete strcture. It was submitted as a joint venture by Toebe Construction Co. of Wixom, Mich., and Stevin Construction of The Netherlands. Their bid of $76.8 million was $9.6 million under the low bid of $86.2 million for a steel structure. A special feature of the contract, which accounted for the lower bids, was an "escalator" clause for fuel, cement and steel, which allowed the contractor to be reimbursed for higher costs of those materials as inflation drove up the prices. The nation then was experiencing a period of high inflation. FHWA, which is paying 90 percent of the cost, approved the low bid and construction began in October 1979. The new bridge will be approximately 1.5 miles long and has a 125-foot clearance over the shipping canal in the Saginaw River. It will allow both vehicle and ship traffic to move freely at the I-75 river crossing. The length is necessary to obtain the clearance required by the U.S. Coast Guard to allow ocean-going vessels passage underneath without exceeding the maximum grade, or incline, for the roadway that is standard for the Interstate system. The new bridge is actually two bridges side by side, one for northbound traffic and one for southbound. Each bridge will have three 12-foot-wide driving lanes, plus one 12-foot truck-climbing lane and two shoulders.